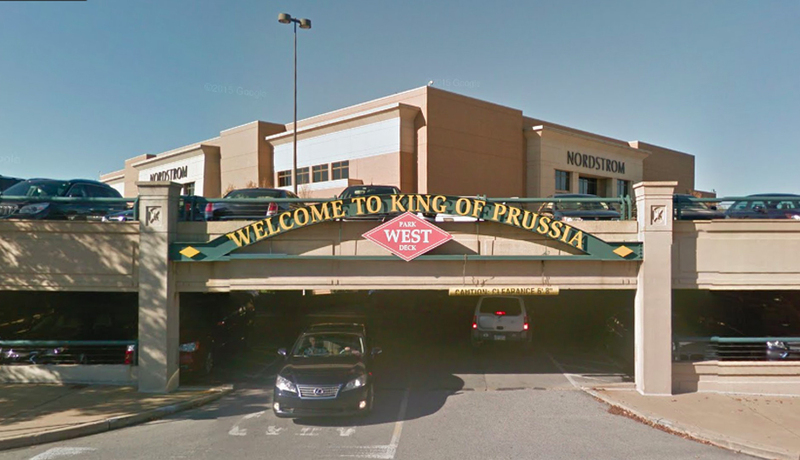 Upper Merion Township police wounded an armed robbery suspect during a confrontation in the parking garage connected to the Lord & Taylor and Nordstrom at the King of Prussia Mall on Sunday afternoon, according to multiple outlets. The suspect, whose identity is being withheld pending charges, reportedly tried to run over responding officers and slammed into several squad cars in the Green Parking Deck at about 4 p.m. That’s when officers opened fire on the man, Upper Merion police chief Thomas Nolan told 6ABC. According to police, the suspect is a serial robber implicated in at least three other crimes, including a carjacking in the same garage a day earlier. After being shot, the man was taken to Paoli Hospital for treatment. Nolan said a gun similar to the one used in previous robberies at the mall was found in the driver’s seat of the suspect’s car. A portion of the mall complex was placed on lockdown while areas not in the immediate vicinity remained open to shoppers. Mall officials say no employees or patrons were injured.